On October 17, 1863, President Abraham Lincoln called for 300,000 additional volunteers for the Union army, divided by the War Department into quotas for each of the respective loyal states. If a state did not meet its quota by January 5, 1864, a draft would fill the remaining quota for each state. 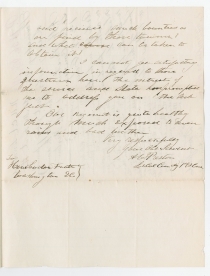 The quota for Vermont was 3,300 men, in addition to the requirements of the July 1863 draft not completely filled. Active recruiting furnished more than 3,700 men by the end of January 1864, and more than 1,000 veterans, like those in Preston’s cavalry regiment, reenlisted in the field. On March 14, 1864, President Lincoln called for 200,000 more volunteers. ADDISON W. PRESTON. 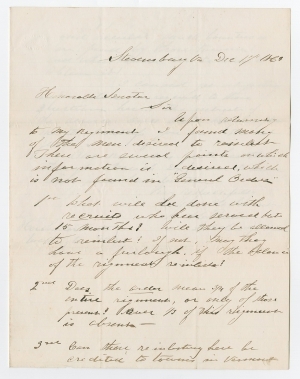 Autograph Letter Signed, to Senator Solomon Foot, December 17, 1863. 3 pp., 7¾ x 10 in. 1st What will be done with recruits who have served but 15 months? Will they be allowed to reinlist? If not, may they have a furlough, if the balance of the regiment re-inlists? 2nd Does the order mean ¾ of the entire regiment, or only of those present? Over ⅓ of this regiment is absent. 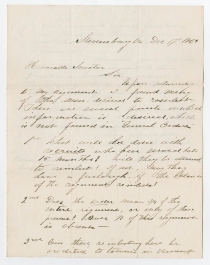 3rd Can those reinlisting here be credited to towns in Vermont <2> and receive such bounties as are paid by those towns? And what course can be taken to obtain it? Will Col. Townsend do Mr. Foot the great favor of furnishing him with the answers to Col. Preston’s inquiries? In answers to questions Nos. 1 and 2, please see enclosed Circular. In reply to question No. 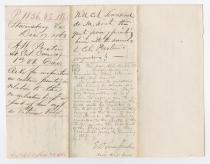 3, I have to inform you that soldiers reënlisting in the field will be credited to the Districts to which they belong at the time of re-enlistment; they will be credited to the quota of the State, under the last call of the President, if they reënlist prior to January 5, 1863. E. D. Townsend / Asst. Adjt. Genl. Solomon Foot (1802-1866) was born in Vermont and graduated from Middlebury College in 1826. He studied law and gained admission to the bar in 1831. He served in the Vermont House of Representatives for several terms between 1843 to 1848, the last two years as Speaker. Elected to the United States Senate as a Whig, Foot later became a Republican and served in that office from 1851 until his death. He served as President pro tempore of the U.S. Senate from 1861 to 1864, presiding during the frequent absence of Vice President Hannibal Hamlin. Edward D. Townsend (1817-1893) was born in Boston and graduated from the United States Military Academy in 1837. He served as a regimental adjutant during the Second Seminole War and transferred to the Adjutant General’s Corps in Washington in 1846. After service on the Pacific coast from 1851 to 1856, he returned to Washington, where he served as an assistant adjutant general throughout the Civil War, under the command of Adjutant General Lorenzo Thomas (1804-1875). In 1869, Townsend received promotion to brigadier general and became Adjutant General of the Army, a position he held until his retirement in 1880.